Charcoal maker's stand near Hachioji. I write for eco+waza, a very groovy company here in Tokyo, about an assortment of eco-ideas related to Japanese culture. Topics are a combination of my own ideas as well as suggestions from my editor. The latter are often particularly challenging assignments that require a fair amount of research and thought, but I love them for just that reason. And without fail, I learn much that gives me even greater insight into the country I currently call home. My latest assignment was to explain to readers why charcoal is an effective deodorizer and dehumidifier. Japanese people have long used it to prevent mildew in kimono closets and keep rooms from smelling musty or particularly stinky after a meal of grilled fish. After loads of reading, an interview with a friendly scientist, and a basic science lesson, I learned that there's more to charcoal than just grilled meat! Read the full article Japanese Charcoal: How and Why This Natural Deodorizer Works Its Magic to get the full scoop. 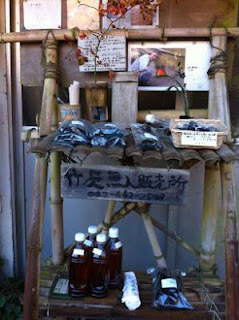 Photo Note: Taken during a hike out near Hachioji, we came across this little stand. I, of course, thought it was a vegetable stand at first, but it instead belonged to one of Japan's last few remaining charcoal makers. At the time I had no idea I'd get this assignment, but I simply took the picture because it looked fascinating. Now that I know what I do, I wish I'd bought a bag of his charcoal for the house or the bamboo charcoal vinegar for the garden. Congrats on the article- how fascinating- although I've used charcoal for such purposes I never understood WHY it worked- and now I do!!! THANK YOU!! Wow- it is amazing. Also- another use which I put charcoal to work in Ghana was IN MY TUMMY- with charcoal pills- when I was get a horrible stomach bug- I would eat charcoal pills and it helped termendously. That's pretty awesome. Never knew coal was a deodorizer or dehumidifier. Great stuff. So it's one of japan's last coal makers? Really? Anjuli, Seriously? You use it? Wow. What's the story there? I'd never heard of this before writing for eco+waza. And yes, the charcoal pills work well for the exact same reasons; however, in both cases it's best to use activated charcoal. Nate, A word of caution. It's not coal, but charcoal. Coal is a different entity, although related, and not one you might want to use to deodorize. :) Yup, it really is one of the last charcoal makers. It's a dying profession here, as the product is as widely used as it once was. Some are working to change that, but even so craftsmen and women like this one are few and far between.